Last week, a [paper] came out that presented us with a new mystery. This paper discussed a fossil mastodon bone from San Diego, but the bone itself was not as interesting as what they found on it. Let’s start with a bit of background. The mastodon is an extinct elephant, distantly related to modern elephants. They lived from the Miocene to the Pleistocene (23 million years ago to 11,000 years ago) in North America and Eurasia. The shape of their teeth tells us that they were browsers and ate a varied plant diet. The American Mastodon (left) compared with the wholly mammoth and the African elephant. From Encyclopedia Britannica. Mastodons were apparently very tasty and a food source for humans. This brings us to this week’s paper. In San Diego, there’s an archeological site in which these authors found a mastodon bone that had been broken apart with stone tools. The bone and molar that had been broken had spiral fractures indicating that they were broken while fresh and not from fossilization. Two large cobbles made of andesite (a volcanic rock) were found next to the bones and are interpreted as hammers and anvils. Supplemental figure 3 from the paper. The figure on the left is showing an exposed mastodon rib on the left and a hammerstone on the right. The figure on the right is showing a different hammerstone. Modern experiments using stone tools on cow and elephant bones create the same fracture patterns as those found in this mastodon specimen. It’s pretty clear that someone was using a stone tool to break apart the bone, probably to reach the nutritious bone marrow inside. The authors also analyzed the age of the specimen and found that it was buried approximately 130,000 years ago. 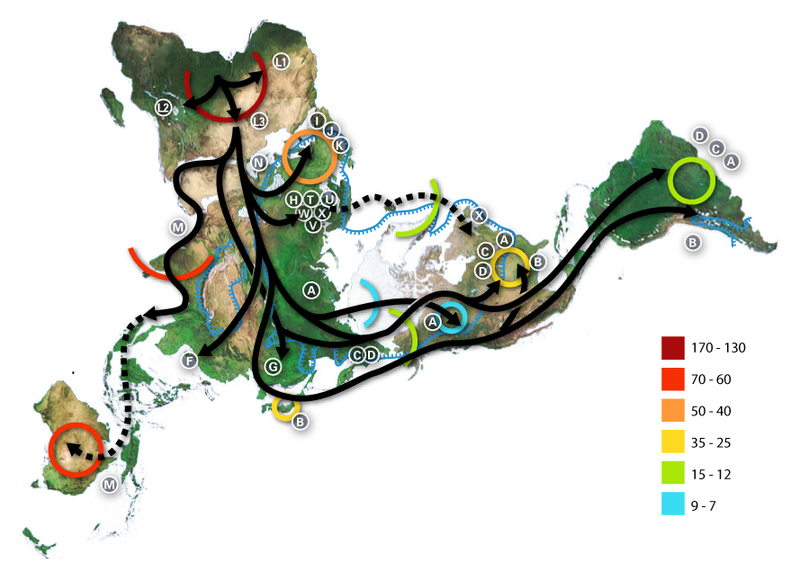 World map (from the North looking down) showing the migration routes and ages of Homo sapiens. From Wikipedia. Here’s where it gets mysterious. Homo sapiens (our species) was hanging out in Africa and only just starting to migrate into Eurasia at that time. We didn’t make it to the Americas until around 15,000 years ago. The specimen in San Diego is 115,000 years older than that. So, I ask you, if not us, then whom?? Other species of Homo didn’t migrate into the Americas and other animals around this time and place didn’t use tools, so this question is very open ended. Maybe there was an unidentified species of Homo living in the Americas that we previously didn’t know about. I’ll finish this post by noting that many experts in the field are debating this find and the conclusions the authors discuss, so we’ll have to stay tuned and see what the resolution is.